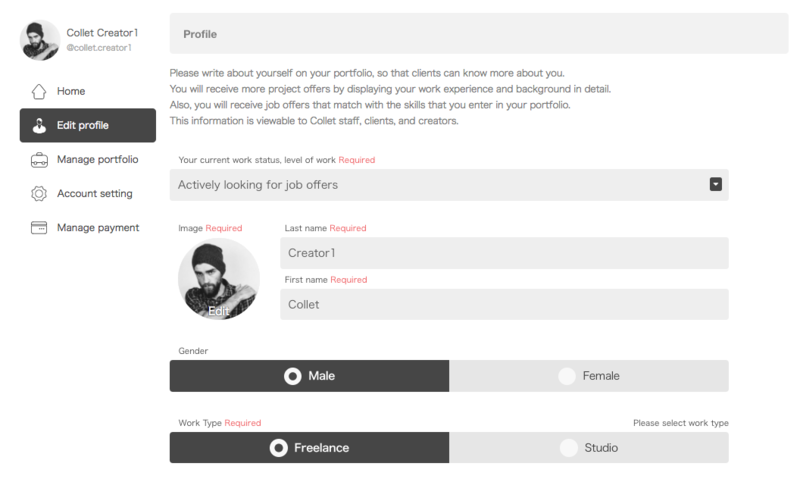 Fill the information of "Edit Profile" screen, and click "Submit". *Notices from Collet will be sent in English if you choose English for "Language". *The language of Collet webpage is depend on your browser language. choose English for the language on the profile page. *These 4 settings are required in order to see job offers. - Profile Image is set. - About (background, work experience, and awards received) is written. - At least one portfolio with status of Public/Members only/Limited is uploaded. If these 4 conditions are not cleared, you cannot see job offers.